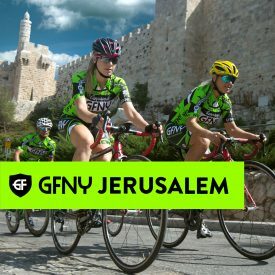 (NEW YORK CITY, April 26, 2018) – GFNY makes history this Friday with their inaugural event in the Middle East in the city of Jerusalem, the most historic city in the world. GFNY is breaking new ground in the Middle East. Over 40 nations and 1300 riders will be representing at GFNY Jerusalem. The event is also the first Middle East – African Championship for GFNY. The top 20% of finishers in each age group in the long route will qualify for the Racer Corral at the 2018 Campagnolo GFNY World Championship in NYC next month, May 20th. It is the last GFNY qualifying event for the 2018 World Championship race. Both the long route (130km) and the medium route (70km) start from the Jerusalem Arena. Riders will ride past Jerusalem’s old city walls and other historical iconic landmarks and ancient sights dating back more than 3,000 years which include the Tower of David, Jaffa Gates and Mount Scopus with views of the Judea desert, Hebrew University, The Knesset and Ei Karem. However, one road on the race course is so new, that construction only finished 1 week ago: a 2km-long tunnel that leads to the GFNY Jerusalem finish line. The mayor of Jerusalem, Nir Barkat, joined GFNY Jerusalem organizers on April 23 for the inaugural ride through the tunnel to the GFNY Jerusalem finish line. The main climbs on course will take place outside of the city, in the Jerusalem hills. Also known as ‘Little Switzerland’, the hills average 10% gradients with a total elevation of 2319 meters over the long route. The multi-national and multi-cultural field of riders will be tackling a demanding course, but all they will have to focus on is doing their best during the race. Top-level security and logistics is in place for the world-class event. The race ends at the Israel Aquarium where a festival atmosphere and post race ceremony and celebrations for riders, friends and family will take place.